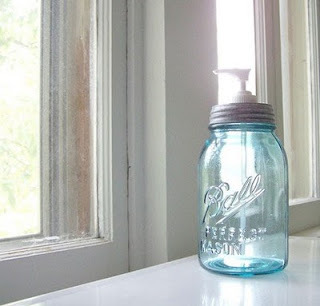 Found these Mason jars with pumps on Etsy from MidwestFinds. My local pals will understand my excitement because they know I love my jars for drinking, storage, etc. I've ordered a bunch of the lids with pumps and they are totally rocking. Forget the fancy aluminum beverage containers. You can't beat glass. Try these out! I agree, glass is so much better for you, and tastes better. I figured, we have so many jars around here, there has to be a way to make this convenient!